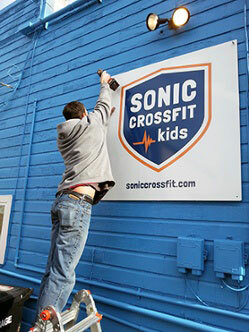 The team also produced a custom, over-sized A-board, 28” x 48”, used to additionally grab attention on the busy street. The A-board also serves as the gym’s wayfinding, with a directional arrow, pointing visitors to the gym. For the interior, the team utilized a custom graphic that expands 10 feet. The “Here Comes the BOOM!” graphic features the gym’s signature colors and was applied to the interior wall to “add energy and excitement to the physical space,” further explains the team.